Sakai Guides and DocumentationSakai Complete User Guide AssignmentsHow do I delete an assignment? Select the assignment(s) you want to delete. Zoom: Select the assignment(s) you want to delete. In the "Remove?" column, click to place a check in the box for the item(s) you want to delete. Click the Remove Selected button at the bottom of the assignment listing. Click the Delete button to confirm the removal of the assignment(s) you have selected. Note: Removing an assignment with student submissions will also delete the submissions for that assignment. 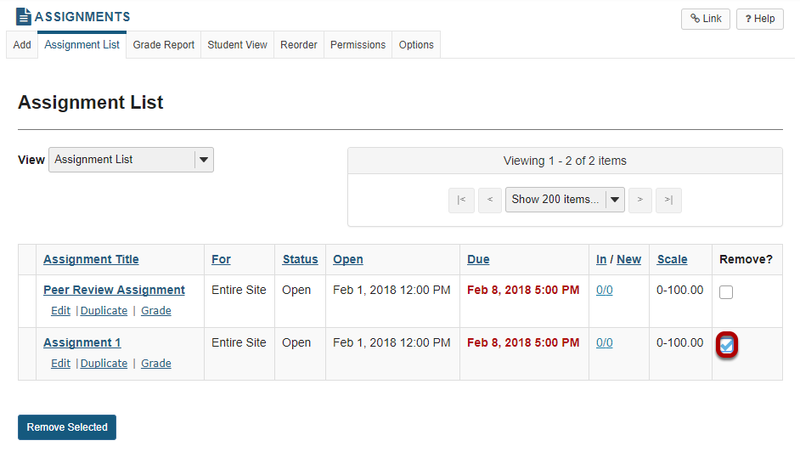 Prev: How do I enable group submissions for an assignment? Next: How do students submit an assignment?